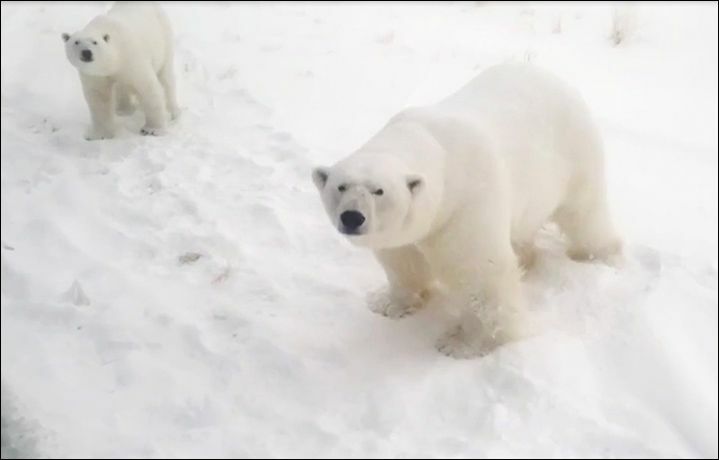 (Siberian Times – which has some really great photos and videos) Former resident Anastasia Bondarenko said the bears are no longer scared of man and have become ‘insolent’. And they are hitting up the dumps. They are searching for free, easy meals. Just like we see with so many other types of animals around the world. Just like raccoons like hitting up your garbage can. So, yes, it is pretty much the fault of mankind, but nothing to do with ‘climate change’. This entry was written by William Teach and posted on at 7:59 am and filed under AGW Scaremongering, Global Warming. Bookmark the permalink. Follow any comments here with the RSS feed for this post. So, the Russians even tried nuking the Polar Bears and they came back even stronger. We need more global warming or the bears will kill us all. So I’m thinking less environmentalism helps the bears.